For a while I’ve had some miso in the fridge. I knew I wanted to try making something with it again so I settled on making soup. 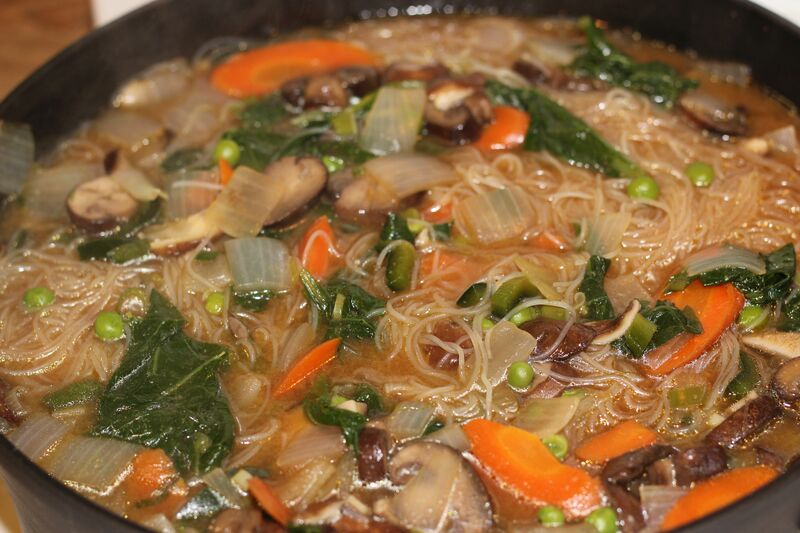 I found this recipe from Vegetarian Times that appealed to me because of the variety of vegetables it includes. Of course, I made the decision to change it up so I got extra cremini mushrooms in addition to the oysters, an extra white onion, a poblano pepper, and went for mustards greens instead of spinach since they were particularly pretty at the store and they’re a winter crop. The grocery store also conspired against me by not having any fresh ginger OR frozen edamame. The nerve! Of course I also doubled or perhaps tripled the recipe so that it would last all week (and then some it turns out, must remember that I’m only feeding two people). Slice 3 large carrots, one poblano pepper, onion, scallions (AKA green onions), and mushrooms and cook in minimal oil for a few minutes. Add mustard greens since they are a little tougher than spinach and I assume take longer to cook than the spinach called for in the recipe. Cook a few minutes. Reduce heat, add rice noodles that had been soaking in water and powdered ginger. I just tend to wing it with ginger since I’m a fan of the spice. Blend a bunch of brown miso in some warm water with a mini whisk or fork. 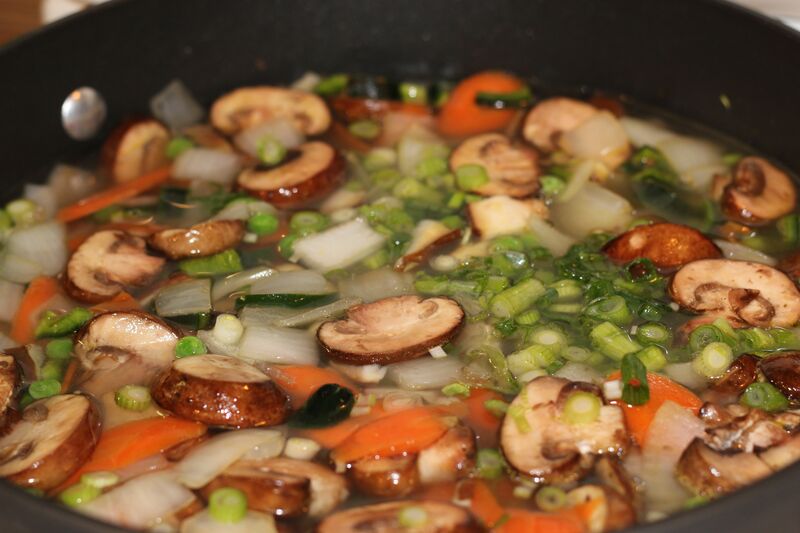 Add miso, sesame oil, and soy sauce to pot. Allow to simmer for a while. Taste and adjust flavors as needed. Of course, soups are always better the next day. We ended up adding sriracha to our individual bowls to make them a bit spicy.